Justice Wide Open : Transparency of the Judicial Process in Modern Technological Courtrooms | Catherine Piché, Prof.
Catherine Piché, "Justice Wide Open : Transparency of the Judicial Process in Modern Technological Courtrooms" in Dominique Custos, ed, Transparency, a governance principle: Proceedings of the XIIth Congress of the International Association of Legal Methodology (Brussels: Bruylant, 2014). 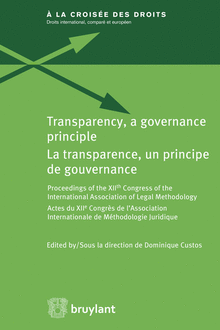 In this book, transparency is dealt with as a methodological principle of governance, whether governance takes on a unilateral or a contractual mode, whether it impacts legislative, administrative, or judicial action, and whether the unilateral or conventional acts are taken by public or private persons. This global approach to transparency contrasts with the segmented approach which prevails in the existing literature. With the many ramifications of transparency, and their interactions, being thus uncovered, this new way of studying transparency makes it possible to map out both the diversity and the unity of the concept. Moreover, this inquiry is conducted by a diverse group of jurists, representing both public law and private law, Europe and North-America. 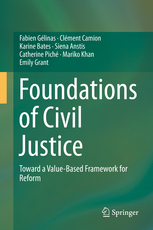 Thanks to the combination of the global and comparative dimensions, this book definitely embarks on the construction of a true law of transparency and furnishes a new theoretical foundation to transparency. Ce contenu a été mis à jour le octobre 20, 2015 à 21 h 34 min.